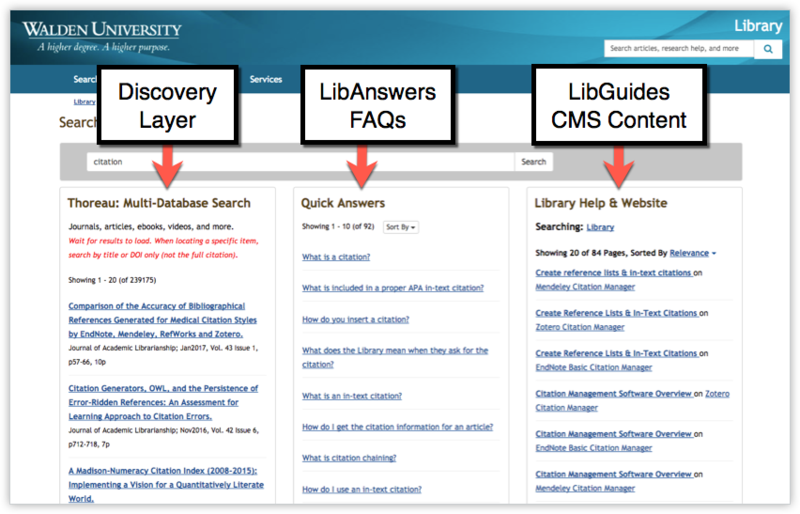 Our unified search options in LibGuides allow you to integrate LibAnswers FAQs, LibCal events, results from your LibGuides Database A-Z list, and results from any 3rd party source – such as your library catalog, discovery tool, etc. Any resource that offers an open search API can be integrated directly in your LibGuides search results page! Even better, you’ll be able to select from multiple layout options for this search. Choose whether to show search results from multiple sources either in multiple tabs on the search results page (1 tab per resource), or use a bento search display, where results from each source are displayed in an individual box on a single page. We’re confident these new options will revolutionize the way users search your Springshare resources – and best of all, all of these great new search features are included as a standard part of every LibGuides subscription! Note: LibAnswers users will see the same great unified search options available in LibAnswers.